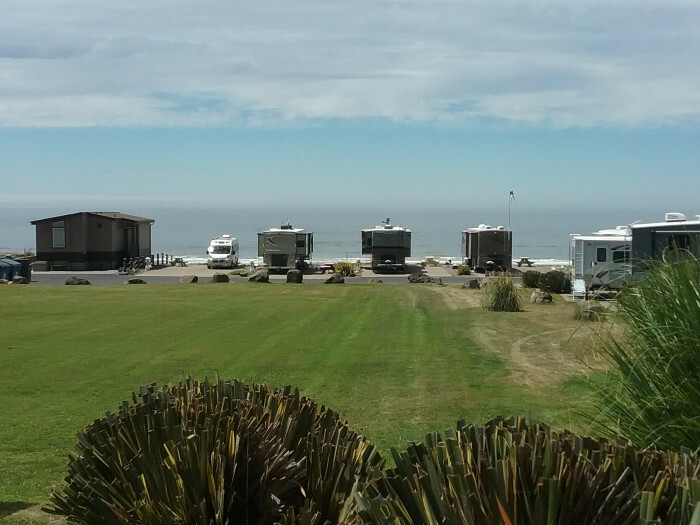 Ask fellow campers about "Sea Perch RV Resort" and nearby attractions. We stay here a few days each year. Very nice small park that is full most every night during the camping season. Reservations are suggested. There is no cell service so no hot spots for internet service. Parks internet isn't what you would expect for the price range paid. I would rate it as poor. Cable tv is also on the poor side but clear skies for satellite service. Hookups are arranged very well and site pad was excellent. The beach is a few short steps and is only other patrons of the park. Sunsets nightly. 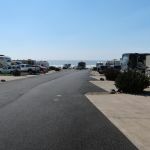 We camped at Sea Perch RV Resort in a Motorhome. Wow... Right on the ocean. Could hardly get closer. Loved it so much stayed an extra day. Its a small resort, but worth every penny. Yachats is 6 miles north and has a couple very nice restaurants. Ona is one we enjoyed. Regardless of previous bad reviews, you should go here. Hosts are very nice, very helpful, and extremely helpful. We had a water system problem which a UPS package needed to be delivered. It came, they called us immediately and even allowed me to replace the water manifold though the rules say no repairs. We had booked two days but wanted to stay a third. No space. 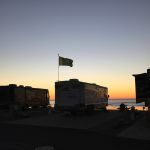 On the morning we were to leave, around 9 AM the host came to our site to say someone had cancelled and did we want to take it.. E YES for sure we will stay.. Bad news.......salt water rusts anything and everything. We camped at Sea Perch RV Resort in a Motorhome. 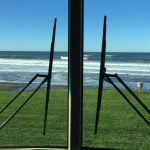 Dinner in Yachats... Ona is a good one..
We reserved a beach front site which means that your site either faces (or backs up to) the ocean waves. Even though we were here in August, the weather can still be quite chilly if it overcast and the wind comes up strong. We had not been here in about 5 years, and some things had changed. One interesting one is that they have taken down several park model type cabins that they had for rent. They are in the process of converting the spaces back to RV spots, and we got one of them that was still in process of being converted. What that meant was that some of the utilities, like the electrical hook ups were still on the wrong side for a head in site. Fortunately I had enough cord on the reel to reach under the rig to the opposite side pedestal. The sewer was also way in the front of the site by the beach, so we needed about 30+ foot of sewer hose to reach the hook up. The park is rather small, 29 sites and the pads are cement and roads asphalt. The on site amenities are a club house, social area, and work out room. A grass area next to the rear sites has horseshoes and corn hole games. No pool or spa, but the beach is very close. The beach is dog friendly, and we took our dog on many walks on the sand when the wind would die down. The biggest negative for this park is a total lack of cell signal. I was able to get an occasional weak Verizon signal with the antenna and booster, but it never lasted long. The park offered Wifi, but it was sketchy and usually overloaded. The other issue here is that nothing is close. The town of Yachats is about 6 miles north on Highway 101, but most of it is twisty with sharp corners, so count on 20-30 minutes one way to get to town depending on traffic. And the town is not very big, so if you need anything special you will be going even farther. 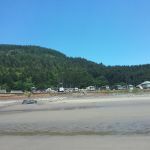 We camped at Sea Perch RV Resort in a Motorhome. Not many choices along the central OR coast if you have a big rig. Ours is only 35ft, but we still had trouble. Were looking for a full hook-up. Sea Perch was a very nice place. Clean, owner and the staff were very good and friendly. The site was clean, big and level. Plenty of room for our rig and toad. The park is right on the ocean with a beach. There are hand full of spaces right on the the beach the rest are along the sides. They are all back-in sites. Ours was called an Ocean View, but that was stretching it quite a bit. You need a site in the low 20s to get a view. The park is right next to the highway and if you are in one of the higher sites near the office, you will hear the highway noise. Otherwise, you hear the ocean and the waves crashing which is much better. There is a very nice club house and they offer a very Saturday night social. It was fun to meet the other RVers. I was very disappointed in the WiFi. Very slow speeds and almost no upload capability. You will have little to no cellphone coverage as well. They have cable, but it was grainy and static and not usable. Restrooms were very clean and laundry was nice, but a little high. It is tight getting around in and out of your space, but manageable and not an issue. Overall, it was a very nice, clean place, right on the beach. You are paying for the location! We felt that $75 was pretty high given the lack of other services. 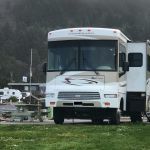 We camped at Sea Perch RV Resort in a Motorhome. This is the nicest campground I have ever been to. The beach is perfect, easy to walk to. We did not have a beach front site but we had a good view from our windshield. The club house was great, clean. We used the free phone. We had plenty of room in our site. We have a 40 ft with a tow. I certainly would come again if we were in the area. 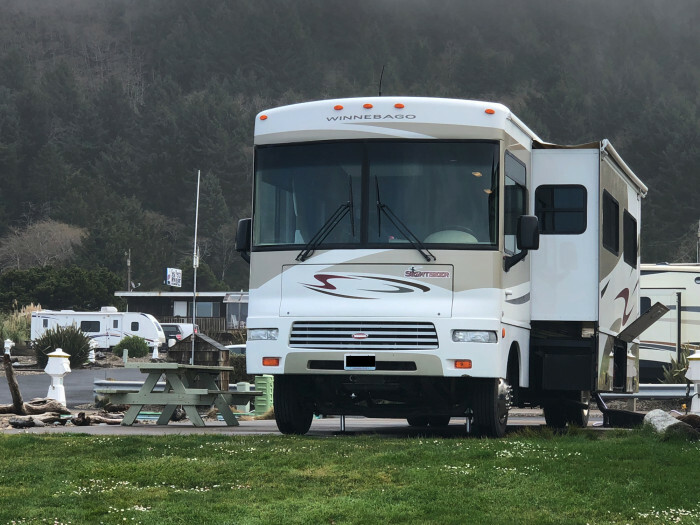 We camped at Sea Perch RV Resort in a Motorhome. This place is almost perfect. The lack of cell coverage and very poor WiFi is a drawback.. I'm not sure what the typical weather is here but we stayed 5 nights and the wind was so strong that we never sat outside. It might as well rained. I'm not blaming the resort. Other than what I mentioned it is one of the best. We camped at Sea Perch RV Resort in a Motorhome. 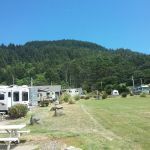 Small, but very well maintained RV park located directly on Sea Rose Beach. All sites are concrete, level, double wide, with the option to back-in or pull-in depending on your type of rig. There are 29 sites here, and 2 are camp host sites. Sites 1-9 are oceanfront with unobstructed views and farthest from the highway. Sites 15-29 are in the middle with a limited view of the ocean (RV sites are parallel to each other). Sites 11-14 have a good ocean view but are VERY close to the highway and are tight to get in/out of so keep that in mind when booking. We stayed in site 14, which we backed into (we have a 5th wheel), but our utility connections were on the wrong side, so we had to run connections underneath the rig. Most sites have a shared pedestal that works for either back-in or pull-in. The view and easy beach access is what makes this park special (and you pay a premium for it!). Utilities worked well but we had no usable cell service. The park does provide secured wifi which worked great! If you need to make a call, they have a private "phone room" where you can make calls (even long distance!) for free. The park has a very nice clubhouse with sitting areas, pool table, foosball and kitchen, along with two private bathroom/showers (one per gender) and one unisex bathroom. Bathrooms were clean, well-appointed and nicely decorated, but could use better lighting. Staff and campground hosts were nice and helpful. On Saturdays, the owners have a community dinner for their guests in the clubhouse, which was a great way to meet other campers in the park! A dozen cable channels were included in the price, but we found most to be fuzzy/grainy. Office area is nice, and they have a small selection of beer/wine and apparel for sale. We enjoyed our stay and would return if we could get one of the beachfront sites. 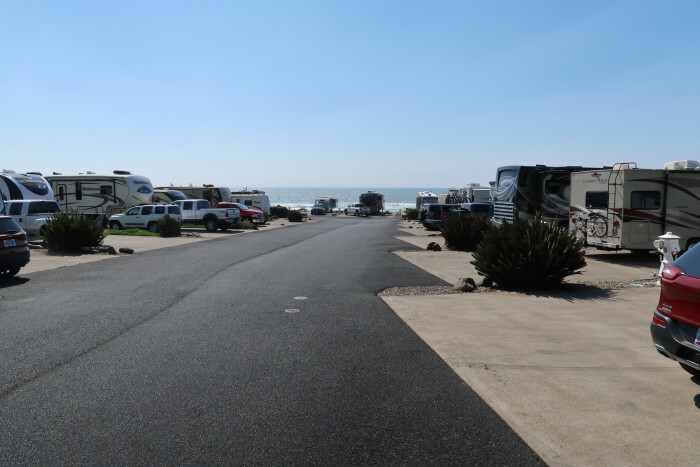 We camped at Sea Perch RV Resort in a Fifth Wheel. Devil's Churn and Thor's Well are very close to the park and best seen at high tide. Thor's Well is not clearly marked from the road but is part of Cook's Chasm so park there and take the hike down. Go up to Cape Perpetua, which is the highest point in the area for great views of the ocean. Yachats is about 6 miles north with a few restaurants, but they have no gas/diesel available there. We drove south to Florence (about 18 miles) to get diesel and bought groceries at Fred Meyer. All the superlatives are correct. The views are incredible, the facility immaculate. You can literally be steps from the beach. The club house outstanding for a park this size. Office staff helpful. If phone coverage is necessary, it is difficult to impossible to connect. There is a phone/internet line in the club house that you can make outgoing calls. Internet is spotty. All spaces have a great view of the sky for satellite. We did not test cable. For rigs over 40 feet that are parking in ocean front sites - the two far end sites on either end are very tight. They are doable but you need help getting in - and out. One end has a large rock in the rear and the other a steel guardrail requiring a sharp turn to get out of the spot. The manager helped and it worked out ok. The sites in the middle should be no problem for any size. The ocean front sites utility set up - at least on the one end, requires an extension for the sewer (they supply extensions) as the sewer is actually in front of the windshield and the electric requires running under the coach to the passenger side (they also supply electric extensions). The sites seem better suited for back in rigs. Great hiking, dining, shopping options in Yachts, Florence and Newport (much more tourist oriented). 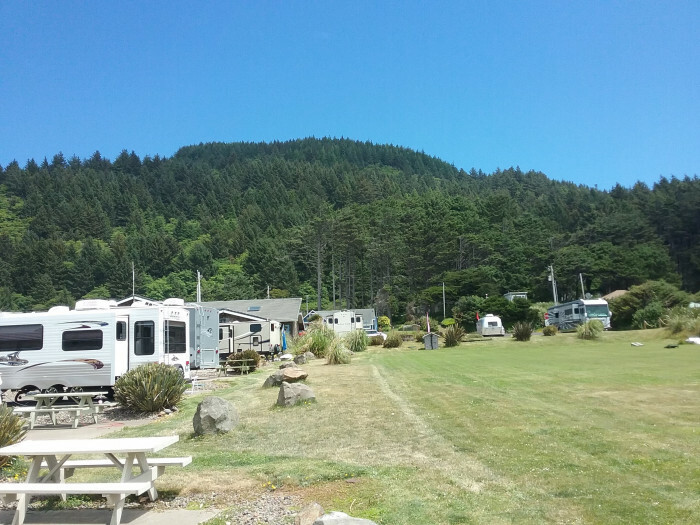 We camped at Sea Perch RV Resort in a Motorhome. This is a first class facility. It is situated beach side with great views. On arrival on a Sunday we were greeted immediately by a jack of all trades, very friendly and welcoming. He led us to our site and spotted us for a back-in. Site was plenty long and very wide making for easy maneuvering (some sites looked like they may be more work to back in to). Site was concrete and included a generous patio and picnic table. Utilities were modern and provided excellent service. Wifi was good, not great. Cable TV was limited to about 15 channels, some with grainy picture. Bathrooms/showers/laundry were in the well maintained clubhouse and were being maintained to an excellent standard. Clubhouse was very comfortable with big screen TV (Direct TV) and an exercise room. Being on the ocean there was a fair bit of wind but fantastic views of the sunset. We camped at Sea Perch RV Resort in a Fifth Wheel. Yachts is about 6 miles north and has a nice variety of restaurants. 17 miles south is Florence a neat little town with a must-see historic downtown area, also with a nice variety of eating establishments. The entire stretch of coast is scenic with many places of interest to see, and many places for hiking. I've lost count how many times we've stayed here, we love this resort. Though most of our trips are in the the Fall 'off season' and Spring Break so rates are a bit cheaper and they often offer buy 2/3 get additional nights free. The Ocean Front sites are the best reason to stay here, the view is just amazing. 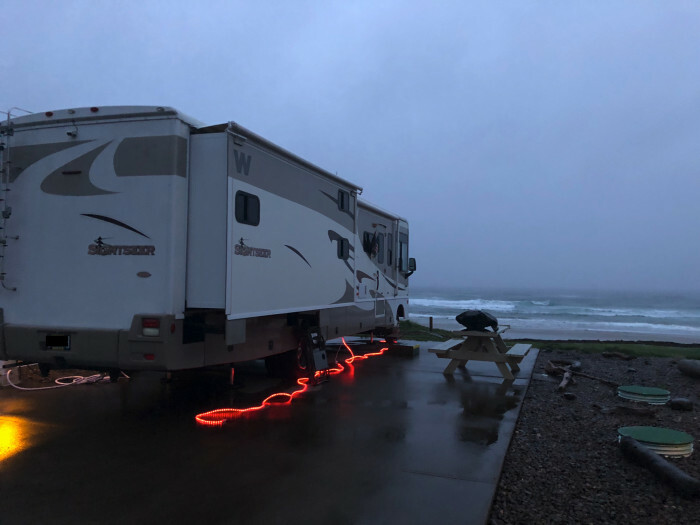 Even on a windy wet Oregon day, to sit in our RV and watch the ocean is wonderful. But a sunny day is all the better. The Club House is very clean as are the showers. They have recently removed a few of the small houses that took up ocean front sites, so it's nice to have more options available. We've only stayed here once when we didn't have an ocean front site, while still a great resort for the price I'm not sure I would come back as often. This is a small resort, so pay attention to the cancellation rules as well as the pet rules. We've never had an issue, but we follow the rules. You won't find playground equipment or a lot of running screaming kids, except down on the beach! We appreciate the atmosphere with or without or kids. No bikes or other wheeled toys are allowed. Good Wi-Fi but be aware that there is no cell service at the time we last visited. 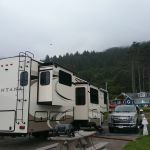 We camped at Sea Perch RV Resort in a Motorhome. First time here? Let the host guide you into your spot. View, view, view. It's all about the view here on Sea Rose Beach. 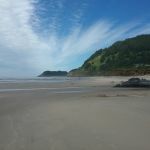 If you love the beach, you couldn't ask for a better place to visit in an RV. Lovely, large spaces, expansive views, comfy and well-appointed club house with fitness center. Front desk help were helpful and friendly with great tips on local attractions. They even offered to back up our fifth wheel into the space! 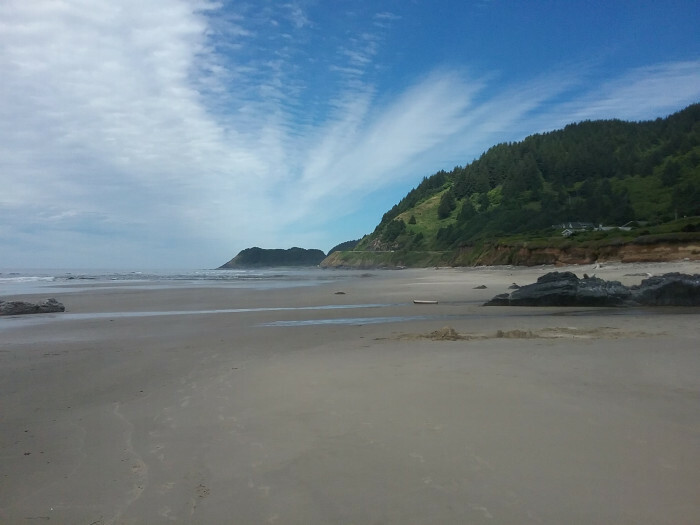 Close to the charming and quaint town of Yachats and most amazing hiking trails on the Oregon Coast. No RV park is perfect so I must mention the minuses. Terrible WiFi. Also my husband fell off the picnic table seat on our pad because the ocean air had eroded the wood underneath. To the park's credit, they immediately replaced the entire table, albeit with eroding paint, however, the wood was sound. Great value, overall, and we would return in a heartbeat. I only wish that they would sell their spaces again because living here would be a dream come true. 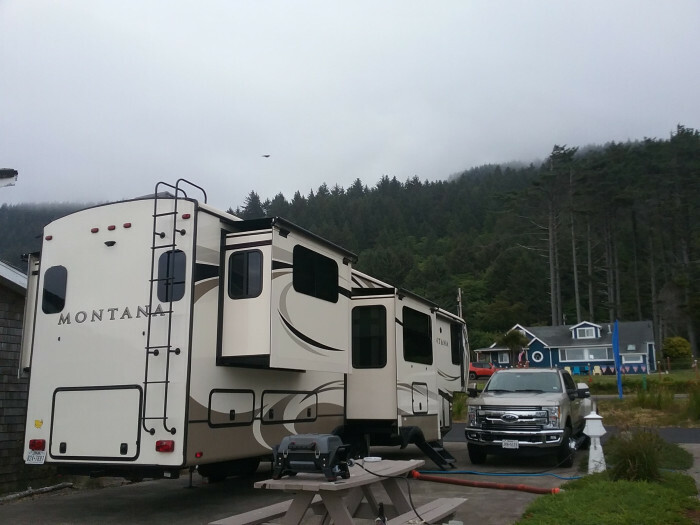 We camped at Sea Perch RV Resort in a Fifth Wheel. Yes, it's expensive. Yes, we have no Verizon cell service. BUT, location, location, location. 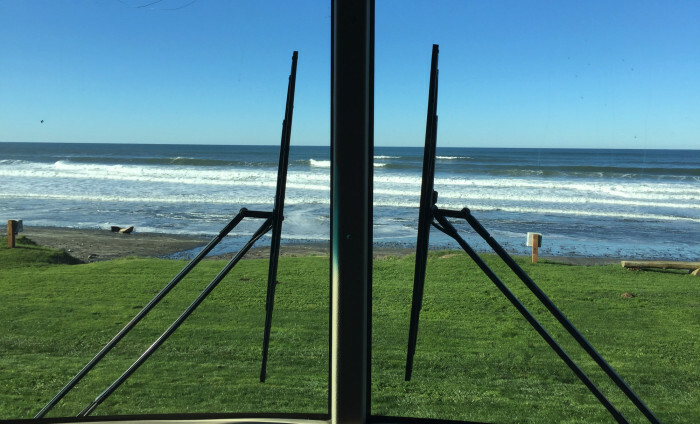 We're parked feet from a 180 degree view of the magnificent Pacific Ocean. Full hook ups, good WiFi, large cement pad. Probably best campground we'rebeen to in past 4 years and we're talking about 140 campgrounds. Just a few sites that are directly on the water. Only park i've Rated a 10. We will be back. 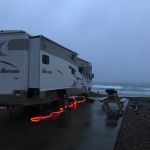 We camped at Sea Perch RV Resort in a Travel Trailer. Ocean view site is very nice, as is the beach. Office staff wonderful to interact with. The clubhouse and game room are great for the size of the Resort. Only minus is the WIFI capability for a resort of this caliber. Marginally functional. Important to us as there is no Verizon coverage at this location. We camped at Sea Perch RV Resort in a Motorhome. Yes, all the raving reviews are correct, this place is awesome. Big rig friendly, beautiful beach for endless walks, super clean park. Strong WiFi helps the fact there is no cell reception. We camped at Sea Perch RV Resort in a Motorhome. Stunning doesn't begin to explain this place. We spent four nights here and we could have spent ten more. We had an oceanfront site and it was simply amazing! Clean and private beach just steps away. Everything was clean and well maintained. (Wifi was bad but oh well) We WILL be back!! 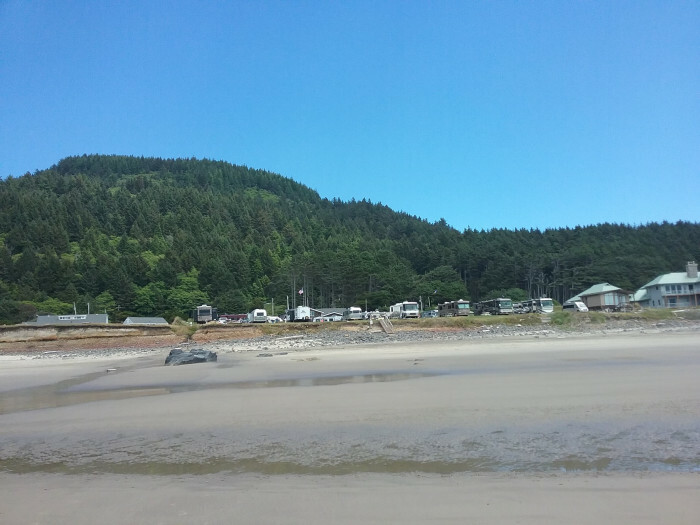 We camped at Sea Perch RV Resort in a Travel Trailer. Devil's Churn and Thor's Well are very close to the park and best seen at high tide. Thor's Well is not clearly marked from the road but is part of Cook's Chasm so park there and take the hike down. Go up to Cape Perpetua, which is the highest point in the area for great views of the ocean. Yachats is about 6 miles north with a few restaurants, but they have no gas/diesel available there. We drove south to Florence (about 18 miles) to get diesel and bought groceries at Fred Meyer. Florence to the South is a charming town. There are several national forest facilities in the area worth visiting. Spectacular view from the top of Cape Perpetua (driveable), one of the highest points along the Oregon coast. It's just a few miles north. Six miles South of Yachats, which has a small grocery store, hardware, and restaurants. Definitely explore the numerous hikes that take you from the lushness of the forest to the crashing waves and tide pools. The Drift Inn, Luna Sea Fish House, Wine Place, and hike the 804! GREAT bakery in Yachats which is about 10 minutes north of the park. The dune buggy rides at Sandland in Florence are really fun as well as the shops in Old Town Florence. 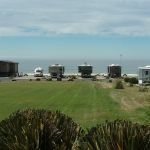 Are you affiliated with Sea Perch RV Resort ?